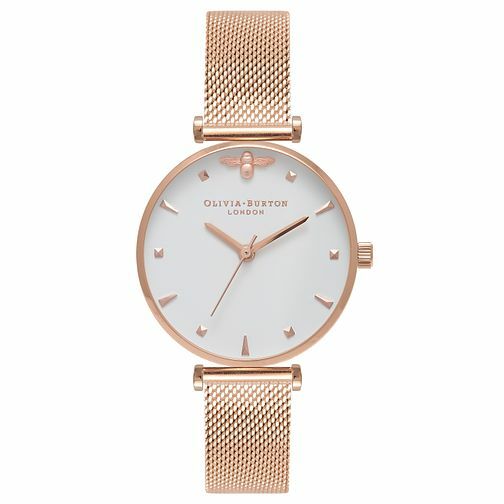 Olivia Burton makes a timepiece worthy of a Queen with this petite timepiece that features the signature bee at the 12 o'clock mark, finished with a minimalist dial and mesh bracelet in rose gold plating. Olivia Burton Queen Bee Rose Gold Metal Plated Watch is rated 4.0 out of 5 by 1. Rated 4 out of 5 by Anonymous from Watch Lovely watch. Looks expensive. Nice and flat. Sadly it does not feel secure to wear. I had this for 2 weeks and it came off by itself even when secured correctly. The clasp is easy to catch and pull back meaning I feel very conscious when wearing it.